This installment of Anomaly is not really a debate, neither is it a "hater" episode. Angela and I try to avoid the typical geek arguments; like, which would win in a fight, a Borg Sphere or the Death Star? This episode is an abstract, philosophical discussion about those fans who prefer one genre over another and what that preference may say about those individuals. Star Trek or Star Wars? Which do you prefer? Why? Angela and I love both and would never reject either of them as a whole, but if someone forced us to choose one, we would have a preference. Listen to the episode to find out what that proclivity would be. This discussion was inspired by Mia, a character from Pulp Fiction, and her question: "Are you a Beatles person or a Stones person?" This installment was also influenced by an article that DavidBrin wrote entitled: Star Wars" despots vs. "Star Trek" populists. Listen to the GeeksOn podcast to hear an interview recorded with Brin (ep. 129). GeeksOn is one of our favorite shows, it's also where Angela and I learned about Mr. Brin's article. He explains, in his own words, his reasons for preferring Star Trek over Star Wars. And, even though we don't agree with everything he said, Brin made some very good points. He's a interesting guy and so are the GeeksOn hosts. Check them out. As promised, here is the summery of Fist Full of Datas (an episode in season 6 of Star Trek: The Next Generation). Spoiler Alert! If you haven't seen this episode of TNG, I do give away the plot in my summery/review. You've been warned. 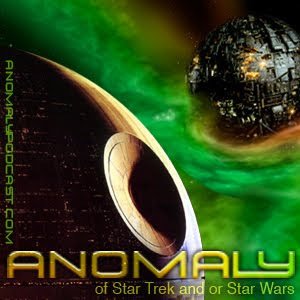 If you're not a subscriber to the Anomaly Podcast, you can stream our latest episode here. If you like what you hear, our show is available via iTunes, Mediafly and Podcastalley.com. You can also subscribe via our main web site. We never take ourselves seriously--we're not all knowing, "we know more than you do" geeks. We're just sci-fi and fantasy fans who also happen to be female; our show is an attempt to offer another perspective to the fan community...a female perspective on all things nerdy. Thank you to Rick Moyer for producing the fun Heisenberg compensators "radio spot" at the end of our show. You rock as always, sir.